The Los Angeles County jails are run by the sheriff, but the Mexican Mafia wields the power in the underworld that thrives behind bars. The organization made up of leaders from various Latino gangs operated like an illegal government, collecting "taxes" on smuggled drugs, ordering hits on people who didn't follow their rules and even calling the shots on street crimes, federal prosecutors said Wednesday. Their clout was diminished as 83 members and associates were charged in a pair of sweeping federal racketeering conspiracies that alleged drug dealing, extortion, violent assaults and even murders. "We just delivered a blow to a cold-blooded prison gang and their associates," U.S. Attorney Nick Hanna said during a news conference. Authorities said the "gang of gangs" — an organization of imprisoned Latino street gang leaders who control operations inside and outside California prisons and jails — was able to control smuggling, drug sales and extortion inside the nation's largest jail system. Indictments detailed how the gang began in the 1950s at a juvenile jail and grew to an international criminal organization with a well-run system to communicate from behind bars, control gang territory and collect "taxes" for drug sales through extortion. 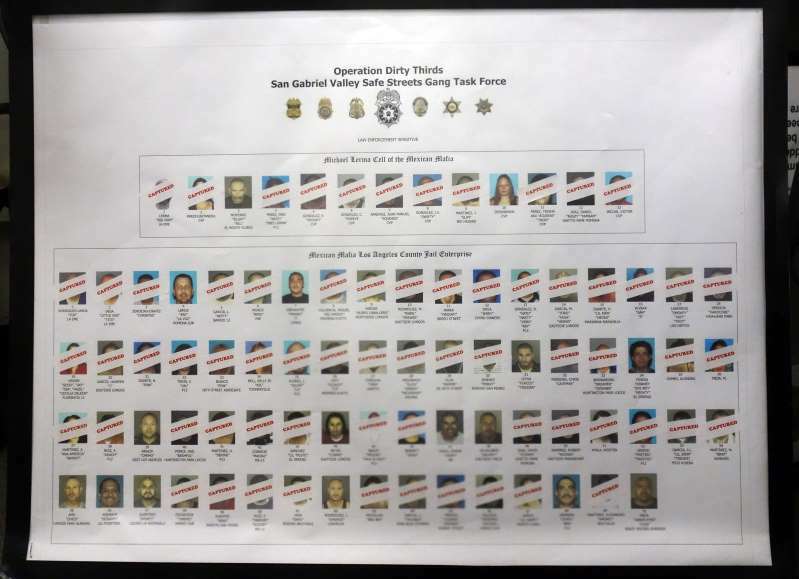 "These Mexican Mafia members and associates, working together to control criminal activity within (LA County jails), have become their own entity or enterprise and effectively function as an illegal government," an indictment said. When methamphetamine, cocaine, heroin and marijuana were smuggled into the jail, the Mexican Mafia got the first shot at selling their stash, prosecutors said. Other groups that brought in drugs had to give a third of their contraband to the Mexican Mafia leadership. The fee, known as a "thirds" tax, gave the name "Operation Dirty Thirds" to the investigation that led to the indictments and arrest of 32 people Wednesday. Another 35 defendants were in custody and 16 were fugitives. The gang enriched itself through drug sales, taxes on drugs and even collected a share of purchases from the jail commissary, the indictment said, adding that the gang was able to exert control by threatening and carrying out violence if people didn't pay up or follow the rules. The gang members were accused of committing vicious beatings, stabbings, kidnappings and murders in retaliation, Hanna said. The indictment alleges crimes between 2012 and 2016, when a grand jury was convened and before President Donald Trump took office. Trump has focused on gang violence but has singled out MS-13, pointing to the gang's gruesome crimes in a push for stronger immigration policies. While MS-13 is associated with the Mexican Mafia, the majority of the crimes listed in the indictments Wednesday are alleged to have been committed by members affiliated with other street gangs. "Essentially, the Mexican Mafia is a gang of gangs," said Paul Delacourt, assistant director in charge of the FBI's field office in Los Angeles. The jail indictment said Jose Landa-Rodriguez and two now-deceased members of the Mexican Mafia controlled operations in the jail between 2012 and 2016. Landa-Rodriquez, 55, is accused of sanctioning murders, assaults and the kidnapping and planned murder of a relative of a gang member who defied him, prosecutors said. Landa-Rodriguez is not a U.S. citizen, though nearly all of the other defendants charged in the indictment are citizens, Hanna said. A second higher-up, Luis Vega, 33, ordered a murder and directed assaults against those who showed disrespect or didn't obey rules, the indictment said. In an effort to disrupt the gang's stronghold, the suspects will be held in federal facilities, and those already in custody in state prisons will be moved, authorities said. Sheriff Jim McDonnell acknowledged that others will follow in their wake, as leadership in the gang that operates in most prisons and jails in the state is always changing. "There will be new leaders, that's kinda how the whole system works. It's hierarchical," McDonnell said. "When one goes to jail or passes away then someone else backfills their spot just like any multilevel organization." One of the group's facilitators was attorney Gabriel Zendejas-Chavez, who was able to carry messages to the gang members while operating under the shield of attorney-client privilege, the indictment said. He is also accused of enabling a plot to extort $100,000 from the Mongols outlaw motorcycle gang. Zendejas-Chavez was arrested Wednesday. A woman who answered the phone at his office was unaware of the arrest and didn't comment.